Avon Park shortstop Cory Leech runs down a Mulberry baserunner during Friday night’s game. The Red Devils drilled the Panthers 11-1. Avon Park second baseman Trent Lewis fields a ball during Friday’s win over Mulberry. Avon Park’s Dayvon Terry scores the final run of the game in Friday’s 11-1 drubbing of Mulberry. Avon Park’s Mason Huertas beats the throw to home plate to score in the third inning of Friday’s win over Mulberry. 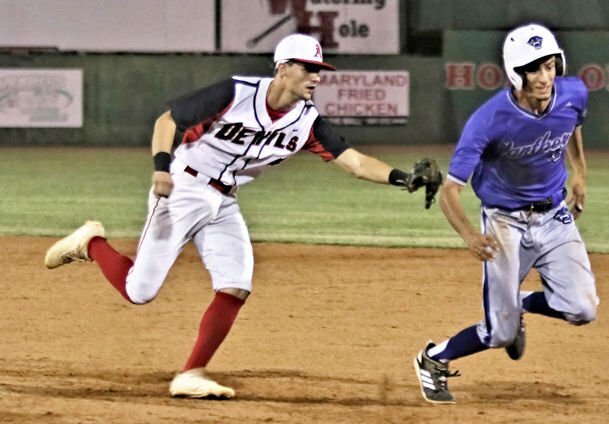 AVON PARK – The Avon Park Red Devils baseball team blasted out of the starting gates to take an early lead and never looked back in mauling district rival Mulberry by a score of 11-1 on Friday night at Charles R. Head Field. 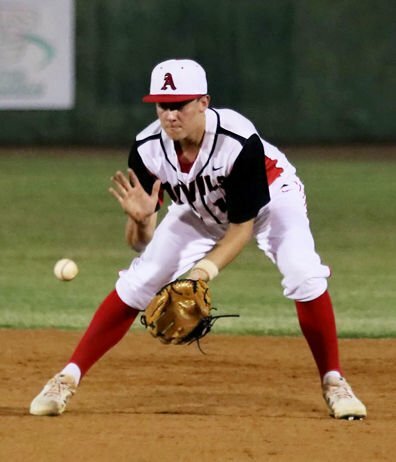 The Class 5A-District 10 victory extended Avon Park’s winning streak to five games in a row as the Red Devils improved their record to 11-3 overall and a perfect 5-0 in the district. Cory Leech started the Red Devils rolling in the bottom of the first inning with a leadoff walk, reached second on a passed ball and scored on a double by Dayvon Terry into the left-centerfield gap to put the Red Devils up 1-0. Terry made the score 2-0 when he scored on wild pitch and Tyson drove in the third run of the inning with a sacrifice fly into right field to bring in Trent Lewis. With two outs, Mason Huertas singled into left field and Luis Perez followed with a home run over the right-field fence to give the Red Devils a 5-0 lead. Mulberry scored a run in the top of the second inning to trim Avon Park’s lead to 5-1. The Red Devils answered with four more runs in the bottom of the third, spurred by a leadoff double by Lewis into the gap in deep right-centerfield, a walk and a hit batter quickly loaded the bases with no outs. Huertas walked in a run to put the Red Devils up 6-1. That was followed by singles by Perez and Hunter Vanderpool that each drove in a run to make the score 8-1. Dawson Bryant capped off the scoring in the third with a sacrifice fly into right field that scored Perez as Avon Park built a commanding 9-1 lead after three innings. The Red Devils added runs in the fourth and fifth innings with Perez driving home Garrick Rowe in the fourth. Lewis put the game on ice with a single in the fifth to drive in Terry to make it 11-1 and end the game under the 10-run mercy rule. Lewis and Perez led the Red Devils with two hits apiece and Perez paced Avon Park with 4 RBI. Terry pitched all five innings to earn the win for the Red Devils. The right-hander gave up one run on four hits and struck out five. Avon Park is back on the diamond on Tuesday when the Red Devils are on the road against the Hardee Wildcats. Avon Park hosts district rival McKeel Academy on Thursday. With a victory, the Red Devils have a chance to clinch the number one seed for the upcoming district tournament.